I have thought about Brad alot on this journey. Personal reflection was my primary reason for undertaking this quest. 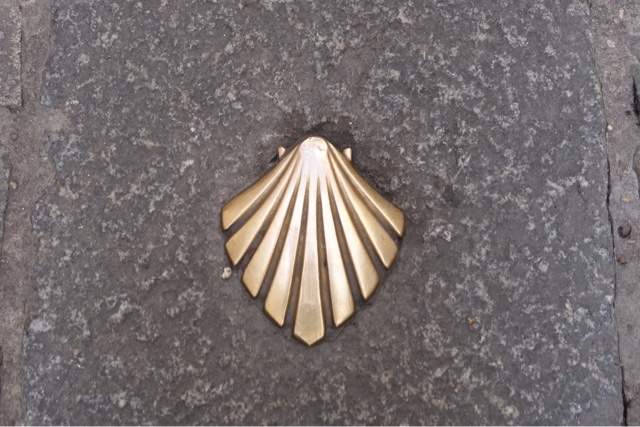 The Clam Shell represents a hand with fingers exemplyfing the pilgrims helping their fellow man. I can think of no one, other than my father, who did more and asked for less than Brad. The last time I saw him he drove me from Natchez to New Orleans airport in the rain on Christmas morning so I could catch my flight. When we shared an apartment we talked often of him traveling with me. Sadly, when he died his filled out passport application was still on his kitchen table. He loved the outdoors and I am sure he would have loved to walk the Camino De Santiago. He will be with me every step of the way on this journey.